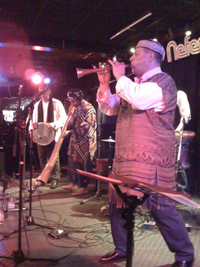 Good music is good music, the various ethnic musical traditions are the basis of today’s so-called Western music. Sephardic and Ashkenazi Jews were only a few who contributed to today’s cultural traditions development. Serphardic tradition with almost all Arabic music traditions. It has no similarities to the East European Yiddish music – Klezmer. by all the environments where Jews have lived and live today. to Swedish folk music, and so on. Later I was also in love with the Sephardic (Spanish-Jewish) tradition. others in the same tradition. (Melody site). As a freelance performing artist I perform myself or in small constellations. Most klezmer gigs, in smaller contexts, I play as a duo with an accordion player. than most big amateur bands. At larger festivals and gigs, I play like the quintet. (Trumpet, clarinet, accordion, double bass and drums). The best part is always to assume the existing conditions for a good flow throughout the program. Call, I will solve this so that your wishes and ideas will be real.